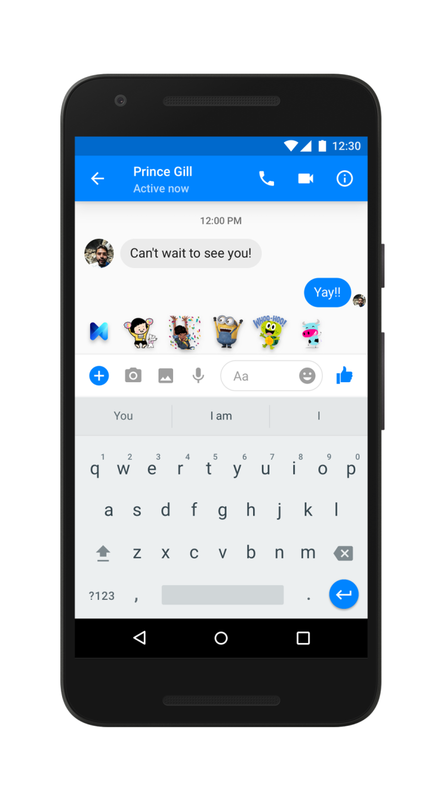 Update on October 10, 2017: M suggestions are now available to all Messenger users in Brazil and Portugal. With M, people in these countries will be able to send stickers, share their location, start a poll (in group conversations), wish people a happy birthday and initiate voice and video calls. Sharing GIFs: When you are talking in a group or 1:1 conversation on Messenger, M will suggest you share a fun GIF to complement or respond to common expressions like “good morning”, “I love you” and “thank you” by surfacing the GIF picker. The GIF picker search bar will be auto-populated with GIFs that correspond to the phrase in your conversation. Quick Replies: When a person is asked an agree/disagree question in a 1:1 conversation, M will suggest quick reply options like “yes”, “no” or “I think so”. Update on August 15, 2017: M suggestions are now available to all Messenger users in Australia, Canada, South Africa and the United Kingdom. With the help of M, people across these regions will be able to send stickers, share their location, make a plan, start a poll (in group conversations), save content, wish people a happy birthday and initiate voice and video calls. Saving content: M will proactively suggest that people save content in their Messenger conversations, which they can read, watch or share later. In addition to URLs, M can suggest saving other content such as videos, Facebook posts, events, and pages. And with the Messenger ‘Saved’ extension you can easily share content in 1:1 or group messages. Wishing people a happy birthday: If the person you are talking with in a one-on-one thread on Messenger has a birthday, M will surface a suggestion to send them a Birthday Wish— a birthday sticker, wish, card or video with accompanying birthday art effects. Initiating voice and video calls: If people are chatting 1:1 or in a group and express intent to make a call, M will suggest a voice or video call in Messenger. So, for example, if someone says “want to call me?” M will surface this suggestion. Also starting today, M suggestions will be rolling out in Spain and available in both English and Spanish. Update on June 13, 2017: M Suggestions is now bilingual and available in both English and Spanish, to Messenger users in the United States and Mexico. M will be able to provide suggestions in the Spanish language, such as sending stickers, sharing your location and making plans. Today we’re excited to announce the launch of suggestions from M to everyone in the US. 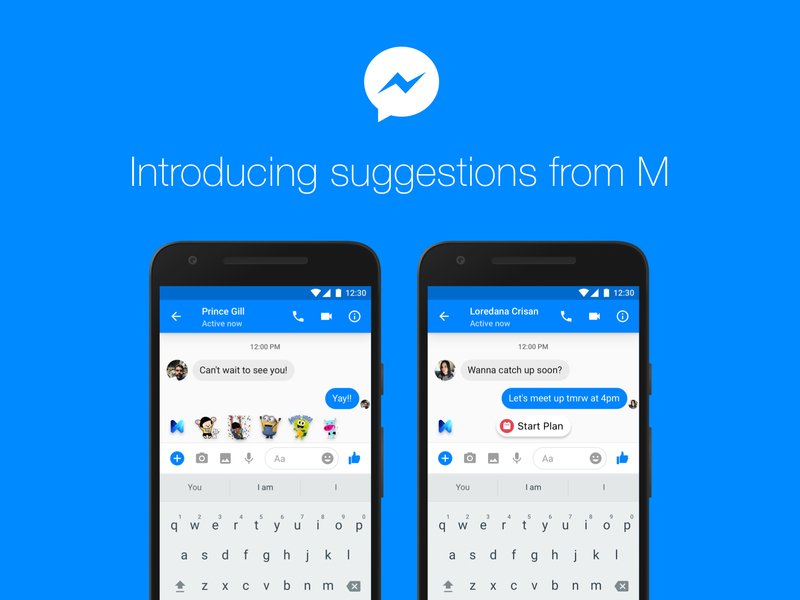 M is your helpful assistant in Messenger, powered by artificial intelligence. M offers suggestions by popping into an open conversation to suggest relevant content and capabilities to enrich the way people communicate and get things done. When we announced M over a year ago, it was a small AI experiment powered by humans that could fulfill almost any request. We learned a lot and these interactions have enabled us to build a completely automated version of M that suggests helpful actions in your chat, exposing features people may not have known were available right in Messenger. 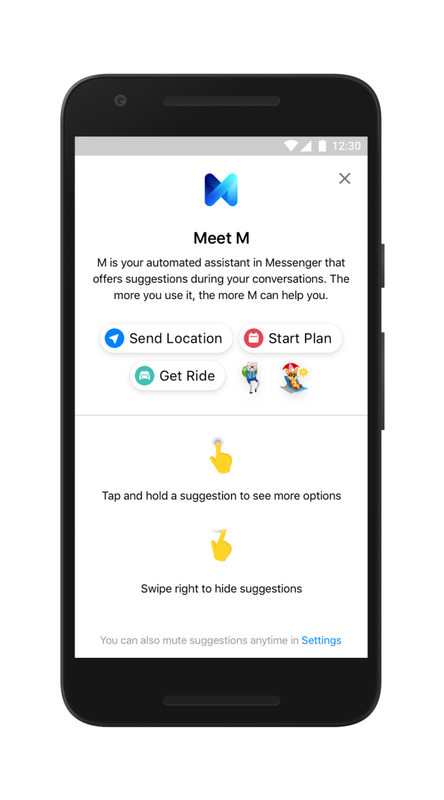 Suggestions from M has been testing with a small percentage of users for the past few months — and it has been a great success — today we’re expanding it to all Messenger users in the US. M is launching today to all iOS and Android users in the US and will eventually roll out to other countries. But this is just the beginning for M… expect to see more and more AI-powered, delightful and relevant experiences improving Messenger for you, every day. We hope that suggestions from M are just the start of what a proactive, helpful and useful assistant can offer to the 1 billion people who use Messenger each month.